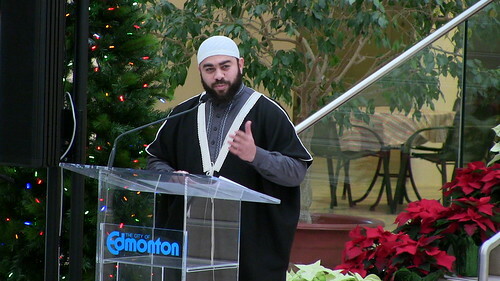 Posted 2:25 pm by Edmonton Interfaith Centre & filed under Blog/News. On Monday October 6 at noon our speaker for Lunch & Learn will be Lee Thompson, talking about Diverse Pagan Pathways in the Edmonton Area”. The meetings are here at 11148 – 84 Avenue, entrance is through the back door in the lane across from Tim Horton’s. There is some parking along our building. Bring your lunch if you like, drinks provided, $2.00 donation gratefully accepted. Posted 3:31 pm by Edmonton Interfaith Centre & filed under Uncategorized. A Buddhist monk meditates during a moment of silence near the finish line of the Boston Marathon bombings on the one-week anniversary of the bombings on April 22. EDMONTON – Violence in the name of religion — where does it come from? Not from the teachings of the religions themselves. In the wake of the tragic events in Boston, the Edmonton Interfaith Centre for Education and Action wants to affirm the inherent value of all human beings, and to condemn the perpetration of violence in the name of religion. As directors and staff of the centre, we state emphatically that no religion promotes violence of any kind. The terrorist acts and threats of the past weeks are not condoned by any religions. Those who indulge in terrorism are acting according to their own misguided personal ideologies and misinterpretations, and for their own agendas. Edmonton Interfaith Centre membership includes more than a dozen different faith traditions, and many denominations within those faiths, including Baha’is, Christians, Hindus, Muslims, Jews, Sikhs, Zoroastrians, Jains, Unitarians, Buddhists, Swedenborgians and followers of Eckankar. The centre, established in 1995, is dedicated to building understanding and respect for the diverse religious traditions that make up the fabric of life in Edmonton. Religious or cultural profiling is not helpful. No one would think of blaming the designers and manufacturers of a particular type of car when the actions of a distracted or drunk driver of that vehicle caused the deaths of innocent people. Nor should any religious tradition be judged because of those who misuse religion as an excuse to act in violence. Religions teach us that violence is not the answer — to anything. We share words like salaam, shalom, shanti, pax — all of which mean peace. This unites us all as diverse parts of a single humanity, each of us created in the image, or containing an aspect of the divine. Traditions like the Golden Rule — “Love your neighbour as yourself” — express our reciprocal responsibility for each other, as taught in all of our traditions. It is a perversion of our traditions and all that they contain when they are used as excuses for violence. Reflecting on the Boston tragedy, and the threats indicated by the arrests of suspected terrorists in Toronto and Montreal, what can we, as a diverse and caring community, do? How can we overcome stereotypes and suspicion? How can we counteract the fear that is raised by these events and accentuated in media coverage? 1. Learn more: explore your own faith tradition more thoroughly to see what is (and is not) an authentic expression of that spiritual path. 2. Get to know our neighbours, participate with them in the projects (such as the Interfaith Habitat for Humanity Build) that celebrate the human spirit and our compassion and caring for others. 3. Work with our young people to ensure that their natural spiritual hunger is met with authentic and meaningful moral purpose and sense of values. 4. Pray: In community and at a personal level. Pray for wholeness and peace, for the victims of intentional violence wherever it occurs, and for the courage to live as our best selves in whichever tradition we are found. Meanwhile, those of us at the Interfaith Centre will continue to plan future events to build interfaith understandings, to explore topics such as the radicalization of alienated youth and responses to terrorism, and to acknowledge the rich diversity of faith, caring and compassion that is to be found in Edmonton and area. As an organization, we remain committed to understanding and celebrating our unique faith perspectives, and to share our best practices with communities around the world. We will continue to plant seeds of hope and positive pro-activity through education and events of a multi-faith nature. For more information, go to edminterfaith.ca or call 780-413-6159. On Monday June 10 at noon, our speakers will be Rev. Dr. Bruce Miller and John Wright, recently returned from the Jesus Seminar. The Seminar is a gathering of theological scholars who share their perceptions of religion apart from any particular denomination, but do not interpret their findings for any one. Their title is, “From Jesus to Constantine,” or perhaps “Christianity: from Jewish Groups to Roman Religion”. Their focus will be on the period when Christianity emerged as a separate religion from Judaism. Scholars seem to be pushing the date of the separation later and later, and John, the author of the Book of Revelation, writing near the end of the first century does not see himself as a Christian, but a zealous Jew convinced that Jesus is the anointed one. Entrance is through the back door in the lane across from Tim Horton’s, bring your lunch if you like, drinks provided, $2.00 donation gratefully accepted. Posted 4:02 pm by Edmonton Interfaith Centre & filed under Blog/News. On Sunday February 10 we held our third annual multifaith concert featuring music, dance and chants from different traditions around the world. Our 2013 volunteer awards, nicknamed IFFY’s by Mayor Mandel, were given to Sofia Yaqub and Rabbi David Kunin. Popular young singer/songwriter Sean Sonego was the Master of Ceremonies, other entertainment was provided by the Balada Romanian Dance Ensemble, the Prince Charles Guitar & Fiddle Group, Nepalese Folk Dancers and the Willan Chorale. The stirring sound of the conch shell being blown opened the proceedings, Buddhist Compassion Chants raised us to an awakened consciousness,and prayers from the Eckankar and Baha’i traditions were included. Prizes were given to three young winners in our art contest. The silent auction was also very lively, and we thank everyone whose attendance, advertisements, donations of items and sponsorships in honour of our award recipients, all added up to make this our most successful fund raiser yet. Posted 4:25 am by Edmonton Interfaith Centre & filed under Blog/News. 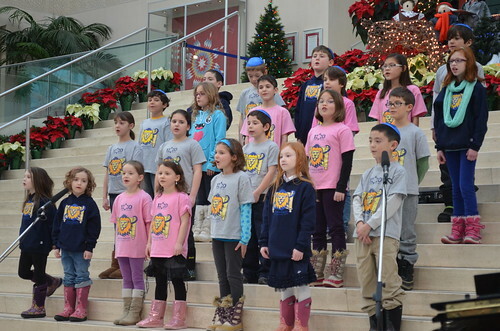 The Centre helped organize A Celebration of Abrahamic Faiths along with the Phoenix Multi-Faith Society on December 16, 2012 at City Hall. 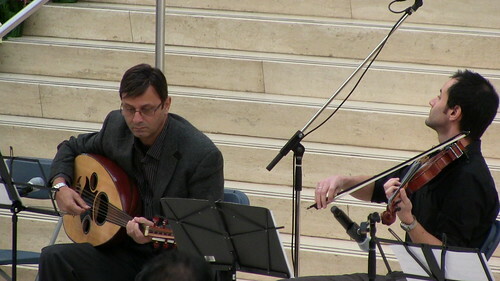 The event featured speakers and music from the Jewish, Muslim, and Christian communities. Here is a look at some of the celebrations. To view the complete set of photos click here, and for videos click here.